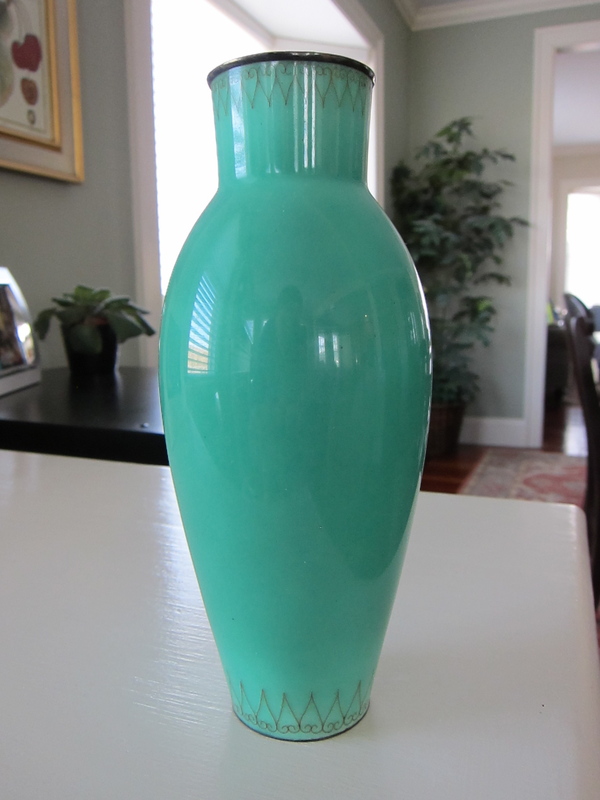 When I wrote recently about my prized, yet mysterious green enameled vase, which was passed down from my grandmother, I never dreamed I’d get a reply just a few days later that helped reveal its provenance. The internet is truly amazing! As a former digital marketer, I’ve believed this for a long time, but I’ve never experienced its power in such a personal way until now. My vase was created by the workshop of Ando Jubei, a Japanese cloisonne craftsman active during the late 19th and early 20th century. He was known for his enameled vases in a variety of sizes, with different types of decoration – many had ornate painted floral designs. Ando was an artist of some significance, as he did receive imperial commissions for which he produced some of his finest works. While I had thought it was bronze or copper, my vase is actually enameled silver – which is difficult to see through the years of tarnish. Now that I know that, I can polish it up to its original shiny glory. The vase was produced at the Ando workshop between 1920 and 1930. The stylized heart motif is crafted of delicate silver wire, as is the mark on the bottom of the vase – not a sand dollar, but a Maltese cross, the mark of Ando. In terms of value, I discovered that a pair of these vases (exactly the same) sold at auction last year for $264.50. Not a huge number, but again, the monetary value is not important to me (unless, of course, it had insurance implications). And final part of the mystery – how on earth did my grandmother, who never once set foot outside of the United States and was not a collector, come to own this piece? Well, when I learned it was made in Japan, I knew immediately how she got it. My grandfather’s aunt was a school administrator who worked in international schools in various countries, including Japan. In fact, I have two Japanese block prints and a hanging scroll in my home – they were all gifts to her nephew and his wife from abroad. Speaking of which…this has given me an idea for my next post! Though it may be awhile before that comes out – very busy week ahead. I’m just so grateful to the reader who stumbled upon my little post about my grandma’s vase, and helped me understand where this treasured item came from, making it even more meaningful to me. Now that you’ve done all the work, I would like to discuss how you were given an opportunity to find all these treasures at Grandma and Grandpa’s house but I was not!